PBS spoke with Writer and Director Bryson Chun about the representation of Hawaiian culture and identity through his film, and discuss how characters Bruce and Makana learn to cope with tragedy. PBS: We see the tension between Makana and Bruce as they feud over a traditional indigenous birthing ritual in Hawaii. Can you tell us more about the history behind this? Bryson Chun: The conflict between Makana and Bruce, to me, stems from an identity crisis of sorts that I think a lot of Native Hawaiians experience. What does it mean to be a Native Hawaiian in an increasingly contemporary Hawaii? Makana and Bruce represent a sort of duality of Hawaiian identity in that one of them practices a strict adherence to tradition, while the other lives a much more “contemporary” life. "It’s not just an idea or an abstraction in a news article. It’s a tangible place with deep cultural resonance and the onus is on us to at least acknowledge that." Ultimately, I was hoping to illustrate that Hawaiians are not a monolith and I think Bruce and Makana are great examples of that. The piko burial in this particular case is a very specific tradition. After a baby is born, it is tradition for the piko, or umbilical cord, and sometimes the afterbirth as well to be buried in a place of significance to the child’s family. There are varying methods that are used, but the idea is the same; by burying a child’s piko, it connects the child to its ancestral land. 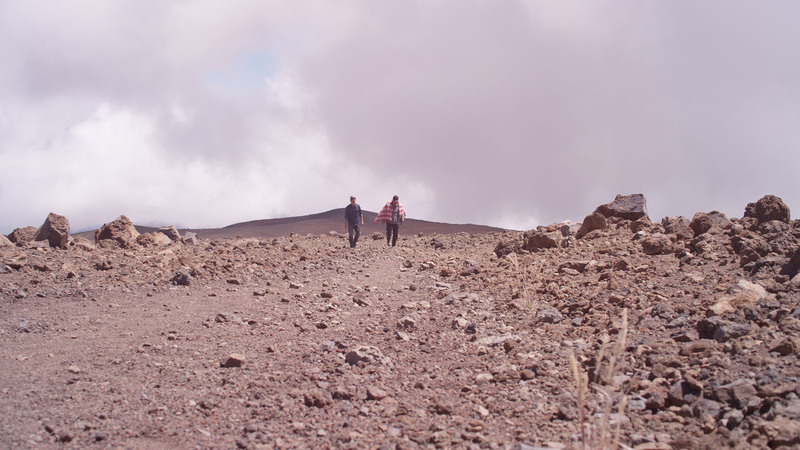 In this film, Lake Waiau on Mauna Kea is the ritual location. Lake Waiau is an intensely sacred place because it is a representation of our creation gods. By burying the piko there, it connects the child to its ancestral land as well as to the gods. PBS: The piko, as we learn at the beginning of the film, refers to the baby’s umbilical cord -- a connection to its mother. We witness the hardship that both men face in the wake of Kelia’s death and they both overcome a turbulent relationship to share this remaining piece of her. What inspired this storyline and what was the decision behind focusing on this son and father-in-law relationship? Bryson: As random as it sounds, a big inspiration for the relationship between Bruce and Makana was the David Ayer World War tank film, “Fury.” I was intrigued by the idea of seeing guys who are dealing with incredibly tragic and overwhelming things and not being able to talk about it or cope with it appropriately. Makana and Bruce are not overtly emotional people, so they deal with their shared tragedy by lashing out at each other and, in earlier drafts, having physical altercations. Kelia ends up being a proverbial Maltese Falcon of sorts, the sort of perfectly unattainable status a person can only achieve in memory. I like to think both of these men were absolutely reliant on Kelia in so many ways and they have to face a future without her for the first time. By fulfilling her wish to perform that piko ritual, they are forced to acknowledge that she’s really gone and although there is a somewhat uplifting ending, I sometimes wonder what those characters would be doing one month after the events of the film, or perhaps one year. I wonder if they will make it. PBS: Makana and Bruce go on a journey to bring the piko to the top of a mountain where we see them eventually arrive at a beautiful lake. Can you take us behind the location you chose and the process of filming there? Bryson: Filming at Lake Waiau is absolutely surreal. It’s a literal lake that’s located near the summit of one of the tallest mountains in the world. It almost feels like it shouldn’t exist. Being there and seeing that lake in person is overwhelming. I think the mana is really palpable there and it was important for that location to be captured on film for that reason. With that in mind, though, I acknowledge that we have to be sensitive about how we share and represent our culture to the world. On the one hand, the location was beautiful and I’m happy for people to see it in my film, but I definitely had to grapple with the idea that some things aren’t meant to be shared in that way. I think it was also important for me to shoot there because of the Thirty Meter Telescope controversy that was making headline news as well. Without overtly choosing a side on the matter, I will just say that I wanted to capture what that location really is. It’s not just an idea or an abstraction in a news article. It’s a tangible place with deep cultural resonance and the onus is on us to at least acknowledge that. That being said, it was difficult to shoot there. It requires a bit of an arduous hike and at that altitude, the oxygen is very thin, so you have to stop every few minutes just to catch your breath. Not to mention the hundreds of pounds of camera gear that we had to lug out there as well. People say it all the time, but I really had the most amazing and enthusiastic crew. We only had one day to shoot there and we were racing the sun the entire time. And I would be remiss if I didn’t mention how amazing my actors were. I was so tired and out of breath that I could barely think straight up there. Meanwhile, my actors are performing ‘oli and acting their a**es off. I owe a lot to a lot of people and I hope this film makes all of them very proud.